Spring is fully here, and every now and then we have beautiful days that remind me that delights such as cucumbers and tomatoes can indeed grow in our garden again. So, it's seed-planting time. I did an order from King's Seeds, which always involves lots of restraining myself. Everything sounds so fabulous! This year I've been a bit indulgent and bought flower seeds. Maybe it's me ageing, but suddenly I find myself wanting to grow a few pretty things that are not my usual natives, fruit and vegetables. 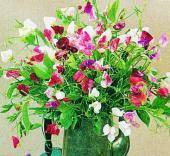 I've got a hankering for old-fashioned pretties, so I chose some cosmos and 'old spice' sweet peas. I'm probably about a month late, but with the help of some soft little hands, the seeds are sown. into strips and write on plant names with permanent marker. And to remind me that seed magic does really work, not only are there the baby coriander plants above that I sowed two or three weeks ago, but there are our sugar snap peas, sown in July and giving us our first pod today. 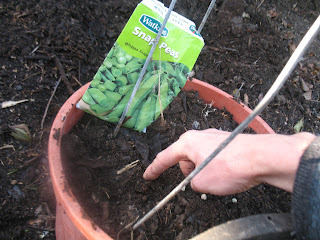 Sowing sugar snap peas, 24th June. Giving us sweet young pea pods today, 19th September.